“Kinyamaswa: An Epic Poem” by Andreas Morgner intimately tells the story of Rwandan refugees after the 1994 genocide. The poem starts with telling the reader the meaning of “Kinyamaswa,” which in Rwandan means “like an animal,” “cruel,” “brutal,” and “merciless.” It then opens with four different quotes on revenge, setting the tone that this epic poem is anything but a walk in the park. The prologue starts with a creation myth about giants who were envious of man and tried seizing power to destroy them; the gods punished these giants by bonding them in chains underneath hills and mountains. However, according to legend the giant’s rage only grew, and they extracted revenge through whispers that could poison man’s mind, leaving mankind to destroy each other. This myth sets up the tension and utter cruelty of the 1994 Rwandan genocide and in a sense, is the only logical explanation for the mercilessness that the genocide displayed. The poem then follows the journey of a man solely known as “The Commander,” detailing what he sees and his thoughts. The reader meets a variety of characters and witnesses the plight of the Rwandan refugees, the effects and horrors of war, and the resolution. 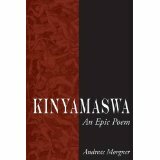 Impossible to put down once picked up, “Kinyamaswa” is an enthralling epic poem on a painful subject and time. It doesn’t hold back, but rather shows unflinchingly the world of war. My favorite quote is from the first canto: “A body caught in the current. Face up. Wearing the uniform of an enemy soldier.” The Commander notes mildly the face is that of a boy’s, with lost years forever separating him from the first shave that would have welcomed him into manhood. It is lyrics like the one quoted above that moved me…milestones that will never be reached by those lost in the genocide, or even those who survived. Something has been taken away from their lives, forever. I highly recommend “Kinyamaswa: An Epic Poem” by Andreas Morgner to a mature audience, anyone interested in Africa, war, or humanity in general, and what it means to be human. What it means to be in trying time. What it means to be tested, and to survive. This entry was posted in Books, Fiction, Poetry - Non-Fiction and tagged Andreas Morgner, Book Review, Kinyamaswa: An Epic Poem. Bookmark the permalink.